Texas and Colorado cruised to victories in the Legends Classic on Thursday. In Austin, five Longhorns scored in double figures as Texas posted an 85-52 win over Eastern Washington. Tevin Mack led Texas with 19 points. Andrew Jones netted 17 points, Kerwin Roach Jr. had 11 points and six rebounds, and Kendal Yancy and Eric Davis Jr. scored 10 points apiece. Bogdan Bliznyuk led Eastern Washington with 22 points, with Jacob Wiley tallying 10 points. 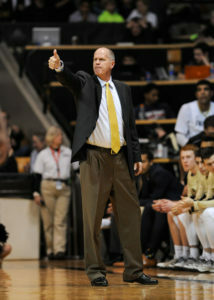 In Boulder, Josh Fortune and Xavier Johnson scored 14 points each as Colorado earned an 89-70 win over ULM. Derrick White and George King scored 12 points apiece and Troy Milton added 10 points for the Buffs. ULM was led by the 15-point effort of Jordan Harris while Travis Munnings and Marvin Jean-Pierre had 12 points each. The Legends Classic Championship Rounds will begin on Monday at Barclays Center in Brooklyn with Notre Dame playing Colorado at 7:00pm, followed by Texas and Northwestern. In Subregional Round play on Monday, ULM takes on Seattle and Bryant faces Eastern Washington. Both games will be played at Eastern Washington.